Visualize a forest. Close your eyes and look around. What do you see? Of course there are trees in your forest. Moss, fungi, lichens and ferns blanket stones and fallen timber on your forest floor. The earth is covered with an array of low growing herbs. Song birds flutter from branch to branch, nabbing insects and berries while adorning the landscape with music. Water springs from high places and collects in low places, forming rivulets, creeks, and eventually streams. Leaf litter softly yields to your feet, like a sponge as you stroll. And above all, there’s the sun, whose presence is subtly felt as gentle dapples, like a shower of light. But the most apparent thing here in the forest may have slipped past your senses, something most of take for granted — relationships. There is nothing more important than relationships. Tony and Amelia walk through their forest garden in Mars Hill, North Carolina. Just think about life in right relation. You have healthy communication with your friends, family and neighbors, and feel good as a result. In right relation we are relaxed, content, and life just works, almost effortlessly. The systems in our bodies, when in right relation, grant us with vigor. When our lungs are in right relation with our heart, our muscles work, so we can walk through the forest. When we engage in wrong relations we get sick. When even a single cell in our bodies stops doing its job, cancer may arise. When two peoples’ communication fails, a fight arises. When nations have unhealthy relations, war arises. When a species goes extinct, entire ecosystems suffer. A forest garden is simply a body of relationships. Our job as forest gardeners, and ultimately as humans, is to foster as many healthy relationships as possible. A bee taking nectar from a flower is a relationship that needs no tinkering. It’s been perfected over millions of years. The flower gets pollinated and the bee gets food. Perhaps the bee pollinates a blueberry and it’s eaten by a bird. The bird flies it somewhere it couldn’t have gone on its own (blueberries don’t have wings ya know), and deposits the seeds, via its droppings — another relationship. The bird stops to take a drink in a nearby stream, created by the relationship between water and mountain. The stream also quenches the blueberry bush. Its leaves perspire moisture, increasing regional humidity, leading to rain showers, and we’ve come full circle. The blueberry, the bee, the bird and the stream are a network of relations who comprise one body: the forest. These creatures aren’t “working,” they’re just living. The forest is perfect. It requires no maintenance, no inputs. A healthy forest needs nothing outside of itself. Now let’s look at a landscape riddled with unhealthy relationships. I’m from Nebraska, the “cornhusker state,” so I would like to take us to a cornfield. What do we see? Corn! And over there? More corn. And last but not least, miles and miles of corn. Let’s try to identify some relationships here, shall we? Uh………..ummmm…..I’m still looking…… aha! Something other than corn! A tractor! The corn and the tractor have a relationship. The tractor is applying herbicide to maintain a pure corn mono-culture. The herbicide is not harming the corn, so it must be herbicide-resistant GMO corn. The tractor also tills the field, applies the nutrients, and harvests the corn. Unlike the interdependence of the forest, there is some serious codependency going on here. The cornfield cannot exist without the perpetual input of fossil fuel (fertilizer, pesticides, gasoline and so on). Mono-cultures, like this, are a lot of work. The work once done by birds and bees is now up to the farmer. But, we need agriculture for food, right? Yes and no. We are between a rock and a hard place. 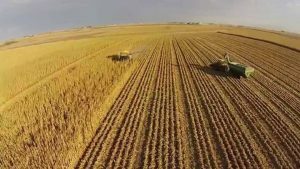 Our population is too big to return to a hunter-gatherer society, and while agriculture can feed us (for now) it’s riddled with bad relationships, placing too much burden on humans and the land. Forest gardeners look to old growth forests as role models. The goal is to develop a garden that acts more like an ecosystem, and less like a mono-culture. The goal is not the mere increase of yield, but the decrease of inputs. Again, forests require no human inputs, yet yield consistently, year in and year out. Forest gardens strive to do the same. But, forest gardens aren’t perfect (yet). They require a massive initial inputs of labor, fossil fuel, and elements like phosphorus and calcium mined from other places. 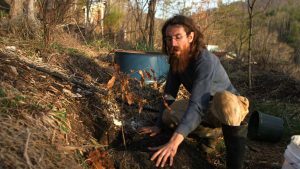 We’ve been developing our own forest garden on a steep acre of land in the Appalachian Mountains. The site faces southwest, has horrendous soil, is exposed to cold winter winds and feels like an incinerator in the summer. The topsoil was washed from our hillside decades ago thanks to clear-cutting, grazing, tobacco and, of course, corn. We are rekindling healthy relationships on this hillside — between the people who garden here, the plants and fungi, and the slope and water. Much of my work is research — research on how a forest should function in our bio-region, which organisms might comprise such an ecosystem, and so on. I am essentially researching my way out of work. That is, I’m designing a system that cares for itself. The goal is to maximize healthy relationships, move away from the codependency model, and toward symbiosis. Since our site is so steep, infertile and dry, the first and foremost relationship we are tuning up is between slope and rain. We want our hillside to take up water just as a forest does. This means slowing the water’s movement. When I first acquired the property, ten years ago, there was nothing to stop the flow of water across the landscape; the hard, red clay was so tightly packed it could hardly drink a drop in a thunderstorm. Healthy forests have a coarse, lumpy texture. Old trees fall during storms, heaving up tons of soil with their root mass, forming pits and mounds that sequester rainfall. Timber lying across the forest floor ads texture, further slowing the water’s movement, and leaf litter covers everything, acting like a sponge. So how did we mimic this? We dug big swales! Swales are ditches that run along hillsides, on contour, that fill up with water during storms. Swales mimic the pit and mound phenomena of old growth forests. Water filling the swales can return to the soil gradually, raising the water table. We also dug a couple of small ponds, and installed cross-drains on our eroding dirt road to fill the ponds. The goal is to keep every drop of rain that falls on our garden in our garden. Another critical relationship is between soil and life. Good soil is comprised of living things and living things are ultimately comprised of soil. Our soil is so poor that until recently not many things have wanted to live on our site. 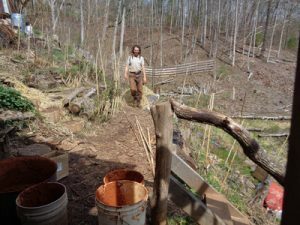 The soil in our forest garden is exclusively red clay with a low cat ion exchange capacity (that is, it’s not very good at holding minerals or water); a far cry from the soft, black soil we see in the forest. What makes forest soil so dark? Carbon. During photosynthesis, plants sequester carbon from the atmosphere in the form of carbon dioxide. The Co2, now in a solid state, is used to form plant biomass. When plants die, or lose leaves, they deliver carbon to the soil. The carbon acts like a sponge in the soil, holding onto water and minerals. The more life you have growing, the more opportunity there is to build good soil. This is why good farmers grow cover crops. Cover crops are grown simply to be turned into the earth and improve soil quality. As forest gardeners, we use perennial species as cover crops. Scotch broom, vetch, white clover, paulownia, elderberry, cardoon, red fescue, yarrow and comfrey are some of the best weedy pioneer plants. They’re just like the cover crops farmers use, but instead of tilling them into the soil, we simply chop them to make little compost piles throughout the garden. And they are perennial, which means they work for us year in and year out, without the need for tilling or replanting. We have seen major soil improvement since employing these methods. The carbon content is rising and the color is changing from red to brown. The earth is becoming more porous from cover crop roots and the gentle tilling the worms and bugs do for us. The soil stays covered year round protecting it from drying and eroding, and most of our cover crops have deep roots that pull up minerals from the subsoil to the developing topsoil. 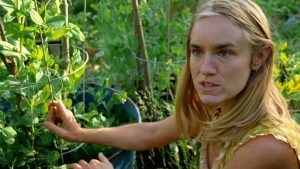 Again, our goal is to establish as many symbiotic relationships in the garden as possible, so we can return to a more healthy relationship with the land; one in which we are simply foragers in an ecosystem, rather than overworked dictators. Republished with permission from TonyAndAmelia.com. 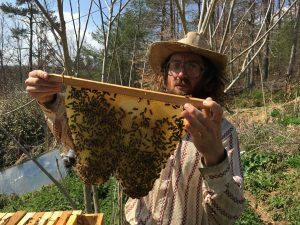 Author: Tony Troia Tony Troia is a forest gardener, homesteader, beekeeper, writer and star of the National Geographic reality TV show "Live Free or Die." Tony really great article.just thinking maybe you should write a book. and glad to hear from you and Amelia. Hopefully all is well. Love your life, would love to visit ya’ll someday and have a picnic. I wish the show would come back featuring y’all!!! I absolutely enjoy this program,it’s food for thought.greetings from south-africa. Ruth Stout was a pioneer in no-till gardening and soil building, she wrote several books and is worth checking out if you haven’t already. Loved watching you both and learning about the earth. Miss the show. Wish you were back on tv. What we need is a invisible hand that can make absolutely everything better by helping companies and people that are doing things that make the world better by giving them extra funding. for example if an electrician or plumber/company fixes the electrical or plumbing system on a low income families home they would be able to offer a steep discount while still being able to pay employees and purchase materials. And that’s why I say it’s time to create a new organization/system that creates co-opitition where people both compete and cooperate to make the world better. For example if an appliance maker develops a more environmentally friendly appliance they will receive extra funding and if they help others to build more environmentally friendly appliances then they will receive even more extra funding or if a forest gardener discoverers a better way of growing food and helps others to do the same then they will receive additional funding. If we give extra funding for making the world better then people will give it maximum effort in order to receive maximum funding which will enable them to do even more good things in the world. I can envision creating an investment fund that gives 100% of remaining profit to companies and people that are doing good things. Our family loved the show! Hoping for new seasons! Hope you are both happy and doing well.